Although I'm partial to strands of pasta, I can't deny that lasagna is included on my list of comfort food. So when my little sis craved for some, I was quick to suggest we try the offerings at House of Lasagna. Unfortunately though, we had to stay indoors, so our best bet was to order House of Lasagna for delivery through TwoAnyOne's services. Like my previous ordering experience, the lil sis and I checked the House of Lasagna menu first on TwoAnyOne's website. And after deciding which lasagna variants to try, we called up the hotline and placed our orders. I forgot the name of the customer representative I got to talk to, but she was very friendly and easy to deal with. I found out that TwoAnyOne still doesn't cover our area in Malabon. However, like before, I just asked if I can meet up the rider. This time, in Monumento since Sangandaan in Caloocan (our meet-up point on previous transactions) is suffering from road reconstruction traffic. Delivery time through TwoAnyOne is usually one hour, but it took the rider less than 60 minutes to reach our meet-up point. He handed me our House of Lasagna orders neatly and securely packed in microwaveable plastic containers inside brown bags. I've heard House of Lasagna offers unlimited garlic bread (for dine-in) with every lasagna order, so we also got a brown bag filled with lots of crispy garlic bread slices. And when I got home in just a few minutes, the House of Lasagna fest began! 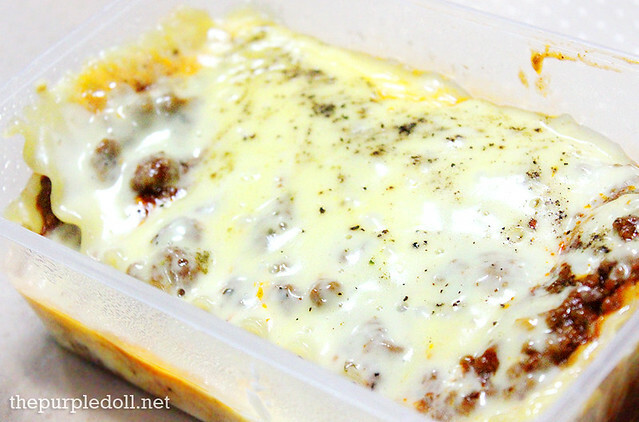 First on our lineup of orders was the Beef Lasagna which my little sis called dibs on. Made from 100% ground sirloin beef, the lil sis happily devoured this generous serving of perfectly cooked meaty and cheesy lasagna. I luckily got a forkful and boy was this such a treat! Every bite was an explosion of savory flavors from the creamy cheese, tomato sauce, ground beef and herbs in between layers of al dente-cooked pasta. Yum! I decided to give our dad the Seafood Lasagna which has layers of perfectly-cooked pasta filled with cheese, tomato sauce and a combination of cod fish, shrimp, clam and squid in alternating layers. 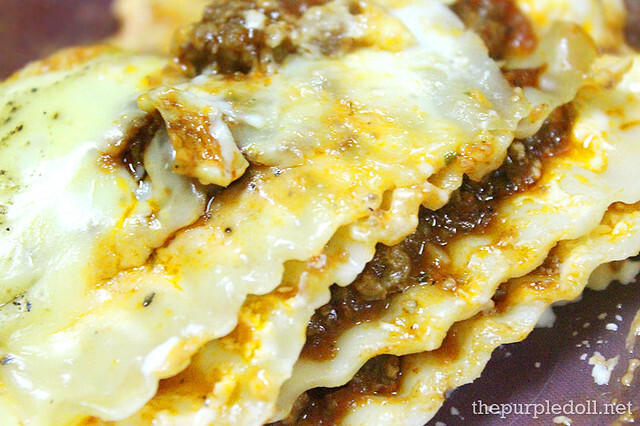 Unlike the Beef Lasagna which punches you on the palate with strong meaty flavors, this variant on the other hand, is more on the creamy and mellow side. 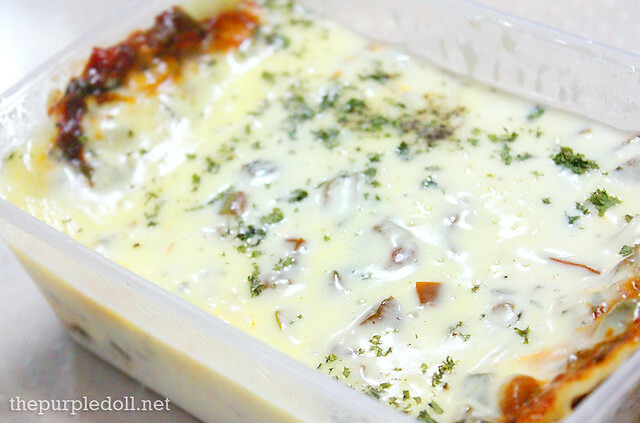 Dad gave me a forkful to sample, and I say, this is my kind of lasagna! Since I wanted to eat more veggies, I had the Vegetable Lasagna which has spinach, zucchini, eggplant, and green and red bell peppers in the mix. 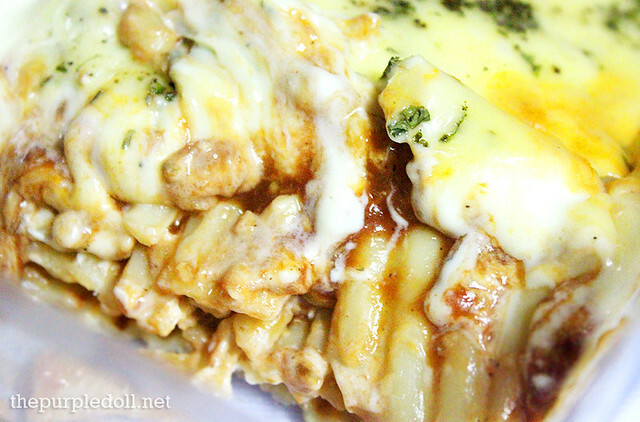 Although it also has the same cheesy layers with tomato sauce, I could really taste the vegetables. And while I initially liked how my lasagna tasted, I have to admit that I found the other lasagna flavors more addicting. I guess I really can't survive being a vegetarian for a meal. Haha! This was supposed to be mom's, but since a single serving of lasagna is already big enough for sharing, she just finished up dad's half and gave this Carbonara Lasagna to me and my lil sis. As much as we wanted to devour this right away though, we were already too full so this sat in the fridge for a night. But despite that, it was still phenomenal the next day. Every forkful had generous amount of bacon, mushroom and Pecorino cheese making every bite taste like real and good quality carbonara, just in lasagna form. Our only non-lasagna order was the Baked Mac and Cheese which was a gooey and cheesy pasta serving with some bacon bits. Since our lasagnas were very cheesy in taste, we expected this supposed-to-be cheese-loaded dish to taste the same. However, it was a little too tamed in the cheese department unlike its lasagna siblings. It wasn't that bad though and we still enjoyed every bite while watching Adventure Time. Haha. True to its promise, House of Lasagna is indeed the number 1 lasagna in town available commercially. All our lasagna orders tasted great and came in generous portions already fit for 2 sharing light eaters, or 1 lasagna-loving hefty eater. It's also an added bonus that they offer different lasagna flavors, a feat sure to make adventurous lasagna lovers come back for more! Props to TwoAnyOne too for the good delivery service which assures us that we can get another round of House of Lasagna without driving or commuting all the way to Quezon Ave. But of course, if we find ourselves in Eton Centris, Quezon City or Little Baguio, San Jun, we'll no doubt give dining in at House of Lasagna a go! grabe lasagna! kakagutom.. >.< sayang kakagaling lang namin near Eton Centris. 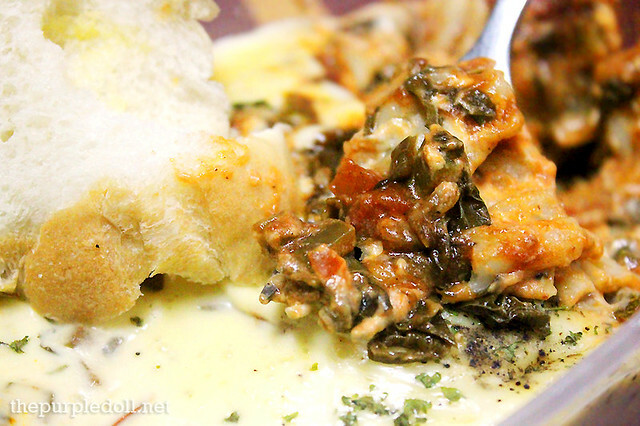 Lasagna is one of my favorite pasta and now I know where to dine Lasagna at its best! Thank you, Sumi! WE. MUST. VISIT. THIS. PLACE. !!! Wow! 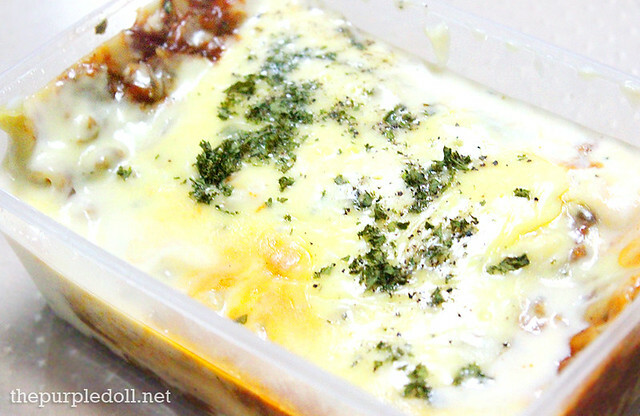 Lasagna my favorite pasta i will surely try it this one! Wow! I love lasagna! :) Want to visit this place too. I Love lasagna. This is a must try! I will definitely visit this place! wow!!! kakagutom naman. 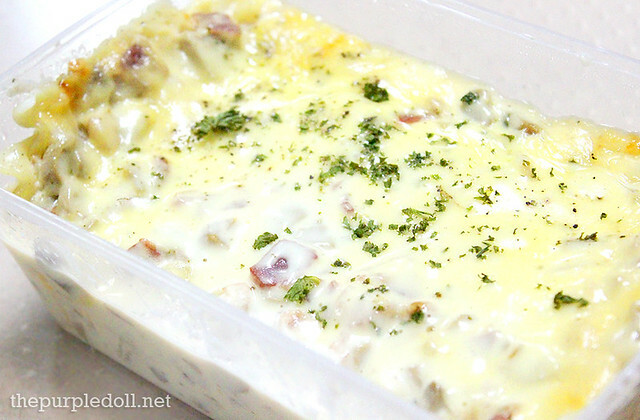 fave ko to lasagna must try this one House of Lasagna. Me delivery na kaya dito sa marulas valenzuela? Everything looks appetizing but I was so excited to try the Vegetable Lasagna as I was puzzled how it would taste then. We tried this last Sunday and it was one of the best for me. :) Definitely good..
love to try the baked mac and cheese and the beefy lasagna!! looks so yummy!! what can i say,i love lasagna! I really liked their Vegetable Lasagna on my first try yesterday. But the Beef Lasagna is the addictive one. 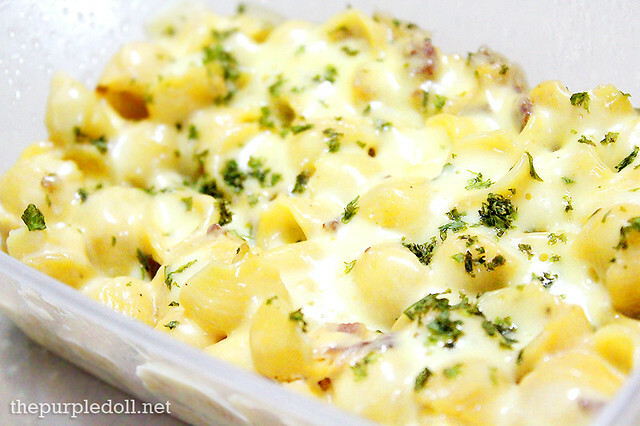 Explosion of cheese and white sauce and the herb-y peppery taste after each bite. The only disappointing one was their Garden Salad. The sauce was too little. Parang small drizzle lang and I barely felt it on the greens tapos binawi nila sa maraming Parmesan. Next time i'd just really stick to their Lasagnas. Really good. Cynos Argan Oil Thairapy Review + Giveaway!